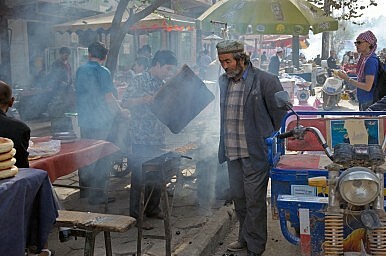 On September 21, there were a series of explosions in Luntai County in China’s far-western region of Xinjiang. State media initially reported two casualties; now, as the BBC reports, Chinese media have upped the death toll to 50. A state news portal reported that 40 attackers (described as “rioters” in the report) were killed, along with six civilians and four police officers. The rioters either killed themselves through suicide bombings or were shot dead by police. An additional 50 people were injured in the violence. Chinese police are calling the incident a “serious terrorist attack” allegedly organized by a religious extremist named Mamat Turson. He was shot dead at the scene. Radio Free Asia had more details, relayed by the aunt of a policeman injured in the attack. According to her, attackers set off an explosive device at a police station before storming both the front and back of the building. Her nephew was stabbed by one of the attackers when he went to respond to the explosion. Another witness described police cars and motorcycles being set on fire. The witness speculated that the attackers were ethnic Uyghurs angry about forced evictions (a common source of discontent across China). All told, explosions occurred at two police stations, a farmers’ market, and a store. The incident follows a May attack on a street market in Urumqi that lead to 43 deaths (including four attackers) and left over 90 injured. Over at War on the Rocks, Ali Wyne looks at the lessons China can learn from Russia’s “Ukraine adventure.” Wyne notes that, despite fears that the Ukraine crisis will embolden China to be more aggressive in its own territorial grabs, the opposite is likely true. Wyne argues that the Ukraine crisis will probably “compel [China] to double down on its strategy of persistent incrementalism and perhaps take even greater care to avoid a conflagration.” Russia has borne a high cost (mostly through Western financial sanctions) for its annexation of Crimea and incursions into Eastern Ukraine; China is not eager to suffer a similar economic body blow. Instead, Beijing is likely to feel validated in its current strategy of “salami slicing” ­— incremental changes that cement China’s control over disputed regions. Willy Lam, writing for the Jamestown Foundation’s China Brief, explores the “rise of the military space faction” in China’s Party leadership. Lam notes that an increasing number of “military entrepreneurs and other non-combatant PLA personnel” are gaining high-level positions in China, resulting in “the partial militarization of the civilian Party-state apparatus.” These officials are not only promoted but favored —so far, no senior managers from military or space technology firms have been targeted in the anti-corruption campaign. Given Xi’s extensive power base in the defense establishment, “militarizing” the Party in part serves to cement Xi’s power. However, it also demonstrates Xi’s desire to keep the Party free from the dangers of liberalism by increasing the influence of military cadres. Finally, Reuters reports that the Sino-Indian stand-off in the disputed region of Ladakh has come to an end. The incident, which saw 1,000 troops from each army facing off, marred Xi Jinping’s recent visit to India. Both China and India had accused each other of building up military infrastructure in the disputed area, in violation of a previous agreement. After discussions between the Indian and Chinese foreign ministers, both sides agreed to withdraw to their original positions by the end of the month.